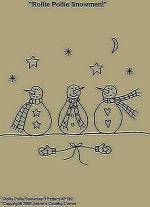 #A218 Primitive Stitchery Pattern "Winter Fun Snowmen!" 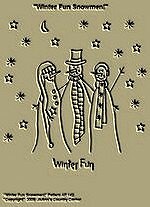 Primitive Stitchery Pattern "Winter Fun Snowmen!" #A219 Primitive Cross Stitch Stitchery Pattern, Quick and Easy "Snowflake Snowman!" Quick and Easy Primitive Cross Stitch Stitchery Pattern, " Snowflake Snowman!" This�Quick and Easy Counted Cross Stitch Primitive Pattern is easy to stitch using only back stitches and french knots on 14 ct. Adia Fabric. Pattern measures 3 3/4"x 5". 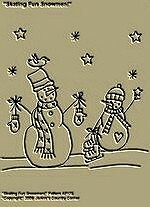 #A221 Primitive Cross Stitch Stitchery Pattern "Snowmen Friends!" Quick and Easy Cross Stitchery Pattern! 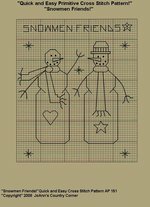 Quick and Easy Primitive Cross Stitch Stitchery Pattern, "Snowmen Friends!" This�Quick and Easy Counted Cross Stitch Primitive Pattern is easy to stitch using only back stitches and french knots on 14 ct. Adia Fabric. Pattern measures 3 3/4"x 5". 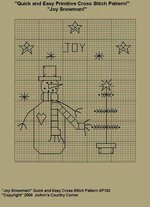 Quick and Easy Primitive Cross Stitch Stitchery Pattern, "�Joy Snowman!" This�Quick and Easy Counted Cross Stitch Primitive Pattern is easy to stitch using only back stitches and french knots on 14 ct. Adia Fabric. Pattern measures 3 3/4"x 5". 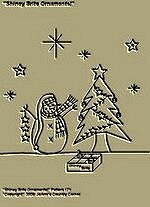 #A223 Primitive Cross Stitch Stitichery Pattern, Quick and Easy " Snow Angel Snowman!" 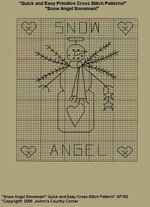 Quick and Easy Primitive Cross Stitch Stitchery Pattern, " Snow Angel Snowman!" This Quick and Easy Counted Cross Stitch Primitive Pattern is easy to stitch using only back stitches and french knots on 14 ct. Adia Fabric. Pattern measures 3 3/4"x 5". #A227 Primitive Cross Stitch Stitchery Pattern, Quick and Easy! " Peace Angel!" 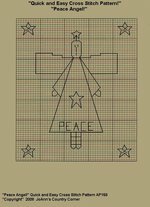 Quick and Easy Primitive Cross Stitch Stitchery Pattern, "�Peace Angel!" This�Quick and Easy Counted Cross Stitch Primitive Pattern is easy to stitch using only back stitches and french knots on 14 ct. Adia Fabric. Pattern measures 3 3/4"x 5". 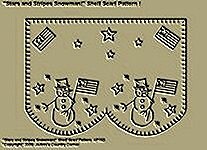 #A254 Primitive Stitchery Pattern, " Stars and Stripes Snowman!" Shelf Scarf Pattern! Primitive Stitchery Pattern �Stars and Stripes Snowman!� Shelf Scarf Pattern!� This Shelf Scarf Pattern can be used to decorate shelves, for Candle Mats, or Bread Clothes to line Baskets. For larger shelves you can place more than one Shelf Scarf side by side each other. Measures 5 �� x 7 7/8�. #A257 Primitive Stitchery Pattern, "Shiney Brite Ornaments!" 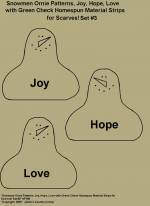 Primitive Stitchery Pattern, "Shiney Brite Ornaments!" Measures 7 1/4"x7 1/2". #A258 Primitive Stitchery Pattern, "Skating Fun Snowmen!" Primitive Stitchery Pattern, "Skating Fun Snowmen!" Measurements are 7"x7". 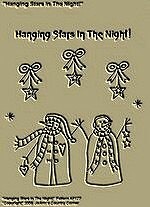 #A261 Primitive Stitchery Pattern "Hanging Stars In The Night!" Primitive Stitchery Pattern, "Hanging Stars In The Night! 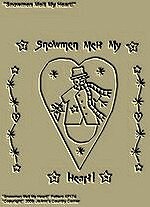 Measures 6 3/4"x 7 3/4"
#A264 Primitive Stitchery Pattern, "Snowmen Melt My Heart!" 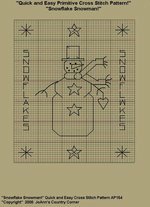 Primitive Stitchery Pattern, "Snowmen Melt My Heart!� Measurements are �6 3/4"x 7". 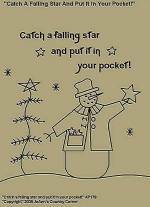 #A270 Primitive Stitchery Pattern, "Catch a falling star and put it in your pocket!" 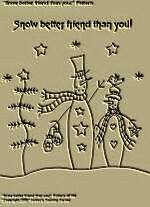 Primitive Stitchery Snowman Pattern, "Catch a falling star and put it in your pocket!" 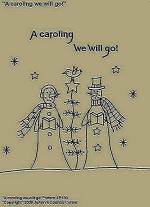 #A271 Primitive Stitchery Pattern, " A caroling we will go!" Primitive Snowman Stitchery Pattern, " A caroling we will go! 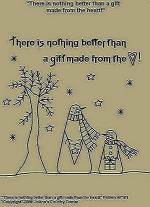 #A272 Primitive Stitchery Pattern, "There is nothing better than a gift made from the heart!" 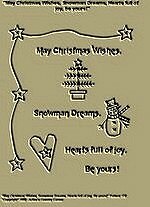 "Primitive Snowman Stitchery Pattern, "There is nothing better than a gift made from the heart!" #A273 Primitive Stitchery Pattern, "Rollie Pollie Snowmen!" Primitive Snowman Stitchery Pattern, "Rollie Pollie Snowmen!" #A282 Primitive Stitchery Pattern, "All Flakes Welcome!" 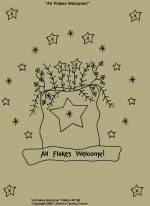 Primitive Stitchery Pattern, "All Flakes Welcome!" #A284 Primitive Stitchery Pattern, " Tic Tac Snow!" 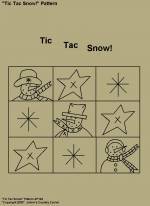 Primitive Stitchery Pattern, "Tic Tac Snow!" Primitive Stitchery Pattern "Snowmen Ornie Patterns, Joy, Hope Love with Green Check Homespun Material Strips Included for Scarves!! Set #3. Included with this Snowman Ornie Pattern you will receive 3 strips of Green Check Homespun Material for you to wrap around your finished snowman ornies for scarves!! The ornies measure 3 5/8"x 3 7/8".